Trailer Hitch Extenders 45789, 45791 and 45795 and Receiver Extensions old part D-189, D-195 & D191. carriers beyond rear mounted car spare tires. - Heavy Duty Construction. See Caution note below picture. 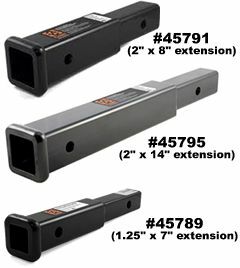 The Curt 45791, 45795 and 45789 hitch receiver extensions allows you to extend your trailer hitch farther behind your vehicle. The hitch extender allows you to mount bike racks and cargo carriers behind cars or trucks with rear mounted spare tires.